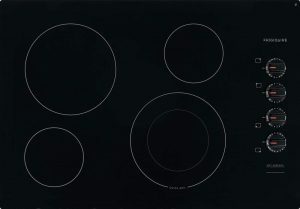 Black Frigidaire FFEC3025UB is a 30-inch size built-in electric smooth top cooktop with four elements. It has the ceramic glass cooktop, hot surface indicator, Ready-Select controls, Quick Boil element and can be set up over oven. The Quick Boil element has 3000 watts of power and you can cook or heat up meals much quicker than normal. The SpaceWise Expandable Element will accommodate different sizes and types of cookware. The hot surface indicator will tell you when the surface is too hot to touch. You can install this glass cooktop over any of the single electric wall ovens by Frigidaire. The four elements are “right front” with 1600 to 3000 watts of power and 6 to 9 inches of size, the “right rear” and “left front” elements with 1200W power and 6” size, and “left rear” element with 2500W power and 9-inch size. Black Frigidaire Cooktop weighs 49 pounds and measures 28.5W x 5H x 20.5D inches (cutout dimensions). It comes with the Frigidaire Fit Promise that guarantees that your 30” or 36” cooktop will fit your current countertop with the same configuration and width. Or you’ll be reimbursed for modifications that cost up to 100 dollars by Frigidaire. It generally fits perfectly over the same size ovens and looks sleek and modern despite being large size. The beautiful ceramic glass cooktop is quite easy to clean as you can simply wipe it with a damp cloth. You can adjust the temperatures easily with the Ready-Select controls on the right hand side. The burners- heat elements on this modern cooktop work very well and efficiently. You can adjust it from boil to simmer without burning anything. It does what it is supposed to do very well with the variety and power offered by the solid and durable burners, and is easy to clean. It heats up your meals evenly and quickly. Black is a versatile color and shall go well with your other appliances in any kitchen decor, no matter what countertop or cabinet color you may have. 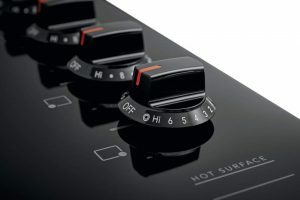 Please note that there are no grill, griddle, induction, pan presence sensor, downdraft venting or sabbath mode on this cooktop, but has a variety of other useful features mentioned in the review. Customer reviews and ratings are good overall as it usually meets the customer expectations, is easy to use and offers great value for money. It is not the cheapest cooktop on the market but after buying and using it for a while you’ll soon realize that you made the right choice. You can be sure you’ll be able to use it for many years to come. Frigidaire 30” Cooktop is a professional looking and feeling unit that is actually reasonably priced for what it is and good value. It is very well packaged and shipped swiftly via Amazon.com, usually within a few days.